I'm having a wonderful time composing a new bass clarinet concerto for my friend, Henri Bok for premiere this July in Ostend, Belgium, by Henri with a wind ensemble comprised of members of the Luxembourg Military Band, at the 2018 conference of the International Clarinet Association in Ostend, Belgium, July 6 - 11. The piece (working title, To Vincent's Stars), explores the musical depiction of Vincent Van Gogh's painting techniques and his recurring concept of "celestial locomotion" - the idea that one might be able to travel to the stars. 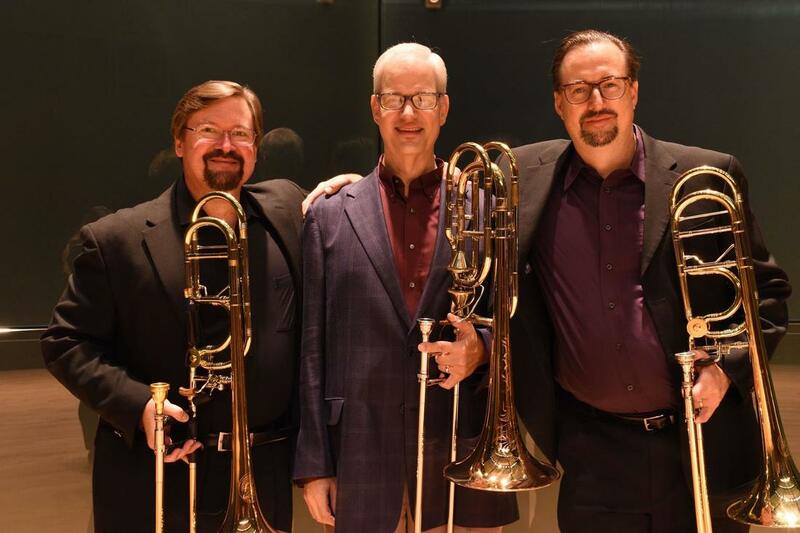 I'm pleased to be working on a new commision for the second CD by the ensemble, Drei Bones, a trio comprised of three outstanding orchestral trombinists who are also respected university trombone professors: Michael Davisdon, University of Kansas, Mark Thompson, Northwestern State University (LA), and my colleague, Timothy Howe, University of Missouri. The new work will be recorded in summer, 2018, and is slated for premiere at the International Trombone Festival, Iowa City, Iowa, July 11 - 14. More details will follow. I'm grateful to the Odyssey Chamber Music Series, Columbia, Missouri, and the wonderful Akropolis Reed Quintet for their premiere of Bright Promise from the Fire ​on October 13, 2017. This piece will soon be available for purchase in the Akropolis Collection - a rapidly growing catalogue of new music composed for this innovative award winning ensemble. More details soon. Listen to audio of the first two (of six) movements, below. ​I'm currently composing a piece - a setting of a beautiful poem by Noelle Kocot - for mezzo-soprano, violin, viola, cello and marimba, for premiere at the 2016 New Chamber Music concert at the Calumet Art Center, Calumet, MI, on July 29, 2016. 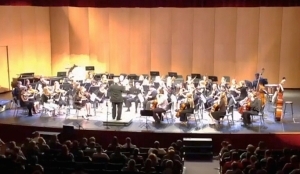 ​In 2015, I was commissioned by the Fort Atkinson (Wisconsin) High School Orchestra to create a piece for the string orchestra, incorporating some improvisation, and to travel to the school to rehearse and coach the piece and conduct the premiere. It was a wonderful experience working with great students and their inspiring director, Erica Flyte. The complete materials (score and parts) are available on this website as PDF files, via this link: The Cranes. I'm delighted to have been awarded a Sinquefield Commission from the Columbia Civic Orchestra to compose a new work for chorus and orchestra (working title: La Terra Illuminata) to be premiered in March, 2013, at the Broadway Christian Church, 2601 W Broadway, Columbia, MO by the Columbia Chorale, Marci Major, music director and the Columbia Civic Orchestra, Stephan Freund, Music director. As the piece explores the intersection between the scientific and artistic imagination, the texts are taken from writings by Galileo Galilei, Michelangelo Buonnoroti and John Muir. Click here for a background article on the event, Columbia Tribune Article, and here to purchase tickets online. Materials for this composition are now available on this website; follow this link: La Terra Illuminata. Dr. Timothy Howe, of the University of Missouri School of Music, invited me to join other MU composers in a project to create some new compositions for trombone and chamber ensemble. 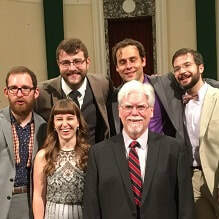 His plan was to give at least five performances of the new works in a variety of venues in the region and at conferences in the U.S., performed by Dr. Howe and his colleagues on the applied faculty, and to create a CD. This new piece, There is a Threeness About You, had its premiere at the MU School of Music on January 29, 20013, and the CD. Across the Wide Missouri: New Music for Trombone, was released in summer of 2015. Materials for this pieces are available on this web site; use this link: ​There is a Threeness About You. In December 2011, I was invited to compose a new work for the University Singers, "the most prominent choral representative of the University of Missouri School of Music," directed by Paul Crabb, for a concert on April 14, 2012 featuring visiting conductor Peter Phillips (founder and music director of the Tallis Scholars). That new piece, ​La Fiammeggiante Luce (The Flaming Light), is a setting of 16th century Italian texts by St. Catherine de' Ricci (1522-1590) combined with remarkably similar texts taken from testimonies of American Shakers in 1842-3, describing miraculous visions. Materials for this composition are now available on this website; follow this link: La Fiammeggiante Luce. I was very pleased to be able to follow through on an idea I'd discussed with Henri Bok a few times over the years: a composition for a large ensemble of bass clarinets! The bass clarinet is such a beautiful instrument and the textures and colors available in a large ensemble are inspiring. And Henri is well known around the world as both a virtuoso and an activist advocate for the instrument. The world premiere of Tempore nobis, for ten bass clarinets, was presented in Avila, Spain, on July 21, 2011 during the XVI Curso Internacional de Clarinetes. (More information on the "Events" page.) After the concert, Henri wrote to say, "The audience, the course/concert organizers, the 10 performers and the conductor LOVED your piece. In my opinion it was maybe the most amazing work of the whole concert (though it was a programme of h'highlights'). Thanks you so much, Paul, for writing this beautiful music...." Materials for this composition are now available on this website; follow this link: Tempore nobis. Jazz composers have been writing "twelve tone" music in a rich variety of ways for more than 50 years. I wanted to celebrate that wonderful spirit of exploration in a composition that keeps the sound of all twelve tones in the air – this time through the use of minor 11 chords (each one containing six notes), as few as two of which sound all twelve tones (“six of one and a half dozen of the other”). I'm grateful for the invitation by Dr. Arthur White, and the amazing talent and commitment of the members of the ensemble. This is one of eleven tracks on a new CD, Tunnel Vision, now available (see "Recordings" page). Here's an excerpt from Wayne Goins review in Jazz Ambassadors Magazine: “Six of One…” is a beautiful cacophony of melodies and counterlines that converge to create an intricate musical tapestry over a tight rhythm section. Using a twelve-tone technique, the minor chord progression seems to constantly shift centers, creating melodic tension and release throughout." Materials for this composition are now available on this website; follow this link: ​Six of One.